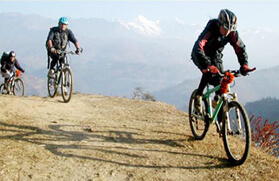 Captivate your senses with a legendary guided bicycle trip in North India. This guided heritage tour will take you to some of the charming and antiquated towns of North India region, which were once the magnificent fortified city of the yesteryear rulers. From gigantic yet glittering Fatehpur Sikri to the wonder of the world Taj Mahal, from the arid desert of Rajasthan to the luscious jungle of Bharatpur, this expedition will give you insight information about India's rich and diverse heritages. Starting from Delhi, the trail will further proceed to Agra, where you can go for a sightseeing tour to Taj Mahal. Next day, you will embark on a drive to Bharatpur, where you can enjoy some birdwatching. For the rest of the days, you will make your way through Jaipur, Sariska, and finally back to Delhi. If everything goes well, according to the plan, you can complete this trip in just eight days. One should avoid going for this cycling expedition during the summer season as the temperature may reach to 50° C in some regions. And cycling in the sizzling hot climate can be tough. 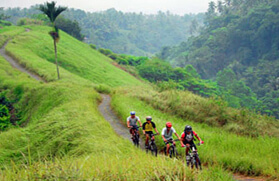 For further details about this cycling expedition, see the itinerary below. If you want to book this tour, then book it with us. And we will make sure that your trip will be a memorable one. Our experienced guides will make you feel like a local as you pedal through bustling Rajasthan villages, explore ancient monuments or test your limits by riding on the sand. Come cycle in North India with us and discover its diversity. Upon arrival in Delhi, you will be transferred to a hotel. Dinner and overnight stay in Delhi hotel. After breakfast, embark on a 5-hour drive to Agra. Upon arrival in Agra, you will be transferred to a hotel. After lunch proceed for a trip to Taj Mahal (1633 AD) and Agra Fort (1536 AD). Overnight stay at the hotel. On this day, you will cover the initial few kilometers by car till Fatehpur Sikri. After a power packed lunch at the Fatehpur Sikri, start cycling towards Bharatpur, which is 22 km away. Overnight stay and dinner at Bharatpur, which is famed as the habitat of 205 species of birds. Post breakfast, start cycling towards a tiny municipality of Bharatpur called Deeg. During the day time, you will explore the Deeg Palace and after lunch embark on a drive to Silsehr. After breakfast, start your cycling expedition to reach Sariska. In the daytime, you will visit the Sariska Tiger Reserve to spot tigers, Nilgai, spotted deer, and wild boar. Overnight stay and dinner at Sariska. Embark on a drive to Jaipur for overnight stay and dinner. Post breakfast; go for a sightseeing tour in Jaipur. Overnight stay in Jaipur hotel. Post breakfast, drive back to Delhi, which is 256 km from Jaipur. On arrival check-in hotel for overnight stay. On arrival in Delhi, you go for a sightseeing tour to places like Qutub Minar, India Gate (war memorial), Lakshminarayan Temple, Rashtrapati Bhavan, Parliament House & Central Secretariat buildings. In the evening, you will be transferred to the airport to catch a flight to your respective destination.